Both of my little ones suffered from baby eczema–it's no surprise since I also have terribly sensitive, eczema-prone skin. Being from the midwest, we also have terribly dry winters that last for months and months. That dry air definitely doesn't help eczema or other skin conditions! The baby eczema didn't seem to actually bother Haiden or Piper, so it was pretty important to me to try at least one home remdy for baby eczema before even considering any pharmaceutical or drugstore treatments. Limit bathing :: Baby eczema is aggravated by overly dry skin, and baths are a primary cause. Baths wash away natural oils, and any water that evaporates off of baby's skin takes additional moisture along with it. Calendula :: Calendula has been used for many years to treat eczema in babies and adults. 1-4 drops of Calendula extract can be added to a tablespoon of olive oil, almond oil or coconut oil. The oil seals in the moisture in baby's skin and the calendula heals the irritation. Oatmeal :: Pour 1/2 to 1 cup of old-fashioned organic oats in a clean stocking or cheesecloth. knot the top and drop it into baby's bathtub. Let it absorb water, then squeeze out the liquid into the water. repeat a few times then let the little bundle float in the tub for the duration of the bath. Baking soda :: Baking soda is basic (as opposed to acidic) and it helps to balance the natural ph of baby's skin. Good old Arm & Hammer baking soda will work for ph balancing, but it has aluminum in it, which you may not want in baby's bath. A good, aluminum-free and organic alternative is Bob's Red Mill baking soda. Add 1 tablespoon to a baby-size bathtub full of warm water and stir before putting baby in for her bath. If baby bathes in a full-size bathtub use 2 tablespoons. Coconut Oil: Extra-virgin coconut oil has antibacterial properties that may be helpful if any eczema patches are raw or exposed. You can apply it to baby's warm skin just after bath, but you can also add a tablespoon or two directly to the bath water. Note: baby's hair will not be clean if you wash and rinse her hair with coconut oil bath water. 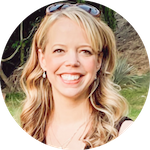 My favorite home remedy for baby eczema was definitely adding coconut oil to the bath water, but, in the end, I found that the best home remedy for baby eczema was simply time. Once we got through the cold, dry winter most of the dry skin patches on their skin went away on their own. 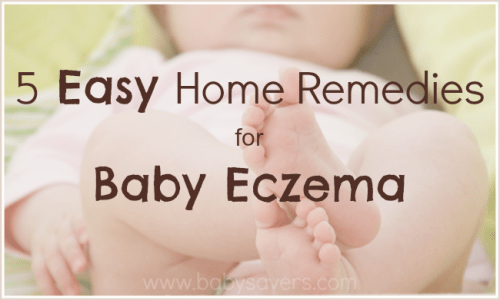 Do you have any suggestions for baby eczema home remedies? Daily baths are actually good for eczema – just make sure its luke warm water and as soon as they get out use plain old vaseline to lock in the moisture – worked wonders on my son’s eczema. He turned 4 in the fall and this was his first winter w/o it – thank goodness! His allergist said most kids do grow out of it! Actually, it depends on what kind of eczema it is. While it happens to some in the winter months while it is cold, it can also happen when an individual is extremely hot, so being in Barbados I find my daughters eczema flares up less when we bathe her twice daily. I’ve tried cortisone creams to help the itching and coconut oil too. It’s mostly genetic so we’re just treating the external symptoms but the genetic cause will always be there anyway and flare up in different conditions and to different foods and such. Also, do your kids have asthma or hay fever? Apparently there is a link. We haven’t noticed in my daughter but she is only 7 months, so it’s too early for any kind of diagnosis of asthma. I second the bath more often comment. The second the kid comes out lather them in cream like Vaseline or glaxal base (the base for most medical creams so hypoallergenic etc). Coconut oil in baths once hair is washed but be careful as baby is slippery. Mine had it on her bum in her diaper once she started solids and until she was potty trained. First thing throw out your Johnson and Johnson baby shampoo or whatever brand you use. It’s horrible for skin issues. Make your own wipes with castile soap, olive oil, tea tree oil and water on good thick paper towels. Store bought wipes have alcohol on them which is drying to the skin. Hopefully they will outgrow it but likely will have some minor issues as they grow. After 1 1/2 yrs of no issues DD just got a patch behind her knee when the temperature dropped (live in the Canadian prairies so yep that happened a few weeks ago). Oatmeal and honey mask works wonders for my kids. Add plain yogurt for additional benefits. Coconut oil works well too.